Shiva is in a way synonymous with the Third Eye. One of the many names associated with him is Tryambaka or Trinetra – the three-eyed one. Because of the Third Eye, he perceives “that which is not.” “That which is” is physical manifestation – “that which is not” is not physical. Right now, what you cannot perceive through your five senses is not in your experience. If willing to strive, a human being can see “that which is not,” that which is not physical – Shi-va. The human aspiration to be something more than what they are right now has taken too many lives, has driven too many species to extinction – even the planet itself is in danger. Gathering money, property, relationships, family, or whatever else may make you feel like you are something more – but only in comparison with someone else. By yourself, nothing of you will be enhanced. Only when your perception is enhanced, the way you experience life is enhanced. This image of Adiyogi will be the largest face on the planet. We are planning to make Adiyogi an iconic presence in the world so that people understand that only enhancement of perception ultimately enhances life. 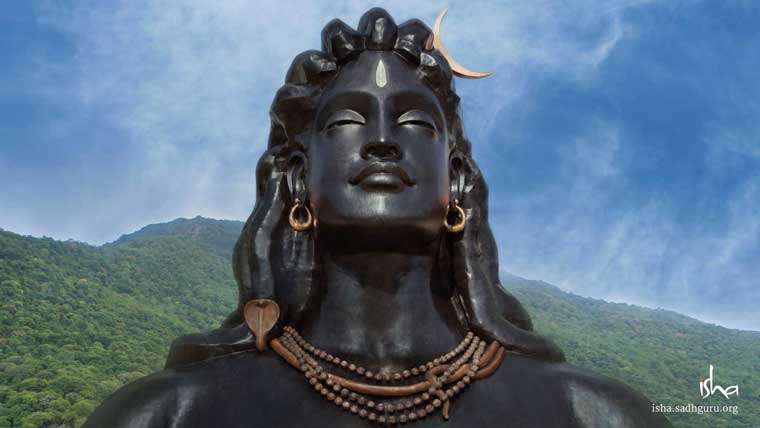 We are in the process of building a hundred and twelve feet tall face of Adiyogi. The number is both symbolic and scientifically significant for our existence because he opened up one hundred and twelve possibilities for human beings to reach their ultimate nature, and there are one hundred and twelve chakras with which you can work. This image of Adiyogi will be the largest face on the planet. 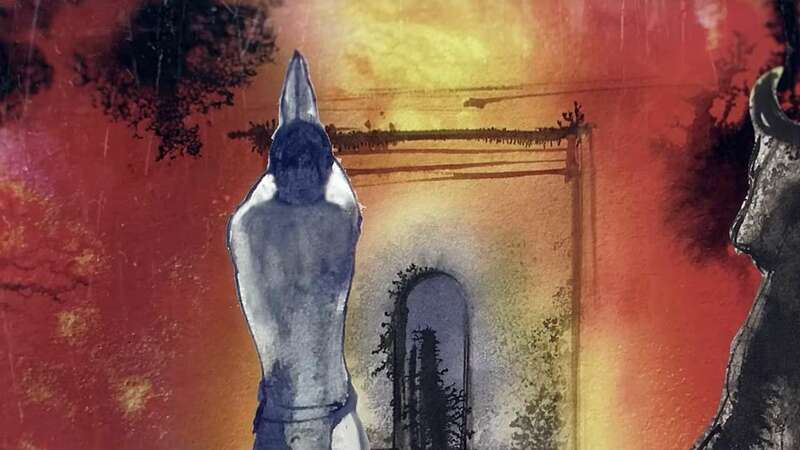 Along with the Adiyogi statue, a book on Adiyogi will come out, and hopefully in the next couple of years, a movie. The idea of creating an iconic face like this is not to build one more monument but to use it as a galvanizing force to transform the world from a mass of believers to individuals who seek truth of life and beyond. You know what terrible things believers are capable of. All the conflict on the planet, though some would like to project it as good versus evil, is essentially one man’s belief versus another man’s belief. The moment you believe something, no matter what it is, you become blind to everything else. For belief systems to work, you need a flock. If you apply your own intelligence and think for yourself, your belief will collapse. The nature of seeking is individual. Every individual has to seek within himself or herself. The most important thing is to build this culture in such a way that it is always an individual seeking, never a religion. The good thing about seekers is they are joyfully confused. When you are seeking, you have something to strive for, but nothing to fight for. The world badly needs this. The way human beings are empowered today, we have a phenomenal ability to create and destroy. When we are striving, we try to create. When we are fighting, we destroy. Believing means assuming certainty about dimensions of which you have really no clue. This will give you confidence without clarity, which is disastrous. Seeking means consciously moving from certainty to uncertainty. When you are constantly stepping into new terrain, it means you are genuinely progressing. Certainty comes from familiarity. When you are making rounds in the same place, obviously you are not going anywhere. People who are exploring different dimensions of life are always uncertain. Great scientists talk in ifs and buts. When you are seeking, you have something to strive for, but nothing to fight for. We will unveil this image of Adiyogi next Mahashivratri. People here are working day and night to keep on schedule. On 25th of February 2017, we will offer him to the world. This is a once-in-a-lifetime event. Those of you who missed the Dhyanalinga consecration, this is your chance to experience something like this, and to make as much noise as possible about Adiyogi in the world. It is very important today that the next generation are seekers, not believers, that they do not belong to some imaginary heaven for which they only qualify after death. This is what believing does – it makes you dead sure about things that you know nothing about. Adiyogi is significant to start a new awakening in the world, where instruments of self-transformation will be common. As today most people on the planet know how to brush their teeth, they should know how to keep themselves peaceful and joyful. Human beings must know how to manage their body and their mind. If this happens, human beings will become a tremendous potential and possibility. Right now, people are capable of making everything a struggle. This is because they do not have tools for self-transformation. It is time we change that, starting in our homes and social surroundings. We can create a culture where we focus more on how we as human beings work. If you understand how your own system works, you can employ it in many wonderful ways. Otherwise, you live by accident, which means you are naturally anxious. That way, the simplest things can be a great struggle. What are most human beings doing? They are earning a living. If they wish, they reproduce. And they will die one day. Every other creature is doing that too, quite efficiently. The point is not that everything that human beings have created is negative. The quality of science and technology and what it can do to the world essentially depends upon what kind of people handle it. The point is to create people who can use science and technology in a sensible way, to enhance life for ourselves and for every other life form on the planet. Not in a way that is destructive for ourselves and for everything around us. Not in ways that brings trouble and suffering upon ourselves and everyone else, which is what is happening right now. You may have noticed, the last two, three summers have been hotter than ever before. In the Himalayas, you can see this too. At Gomukh, where the river Bhagirathi is born, water was spouting out from the mouth of the ice cave like a fountain. Now the ice has melted to such an extent that you can walk a mile into the cave, and only a small stream is flowing out of it. Many peaks that used to be covered in snow throughout the year are not anymore for months on end. River Kaveri is not touching the ocean anymore for nearly three months in a year. In one generation, we have made a river that was perennial for many thousands of years into a seasonal one. What all this means is – the tools of science and technology that we have are in irresponsible hands. What we need is not more science and technology but a transformation of individual human beings. If tools for transformation are not transmitted in a big way in the coming decade, it will become more and more difficult for our children to live well in the world. It is my wish and my blessing that we as a generation should have the privilege of making this happen for future generations. We have just started a new solar cycle. In many ways, the next twelve years are going to be the golden period for spiritual movement on the planet. If we do the right things in the coming decade or so, it will bear fruit much more easily. Human intellect is readier than ever before for something like this. Things are falling together – 2016 is coinciding with similar situations as they were when Adiyogi first taught. All these things are good for us. It is my wish and my blessing that we as a generation should have the privilege of making this happen for future generations. We want to use Adiyogi as an iconic presence to make this happen. We are not promoting him as a god but as a yogi. A god means you have to worship him. A yogi means a possibility. We want to create spaces where tools for transformation are offered to everyone who comes, beyond race, religion, gender, and creed. The first one has happened in Tennessee. No miracles offered, no place to petition – just sadhana; but the numbers of people who are coming there are increasing by the day. If we create the necessary atmosphere, similar places, where people can receive tools for transformation, will happen everywhere in the world. If the necessary integrity and the power of the space are created, people will invariably come. Today, more people than ever before are seeking. More people than ever before are disappointed with whatever belief systems are being propagated. A huge mass of people still hang on to their belief, even though it does not make any sense to them – simply because they do not see a better alternative. It is our responsibility to make sure they find a better alternative, because in this is the wellbeing of the world. If we want a peaceful world, we need peaceful human beings. If we want a loving world, we need loving human beings. If we want a sensible world, we need sensible human beings. If we are interested in creating the kind of human beings that we want to live with, that we want the world to be inhabited with, and that we want our children to live with, we have to make sure that in the next ten to twelve years’ time, every child, before they reach ten years of age, learns a simple process, where they at least close their eyes and sit for seven to ten minutes. Every human being on the planet should know some simple tool for self-transformation. Unless we bring this into their lives, violence and disaster will continue and multiply in the world. By 2050, they are expecting about 9.7 billion people on the planet. The more crowded it gets, the more intense situations will become. If we have to live in close proximity, it is very important that people are as pleasant, peaceful, and joyful as they can be. That is why tools of transformation become super important. I want all of you to somehow make sure everyone in the world will know about the unveiling of Adiyogi. 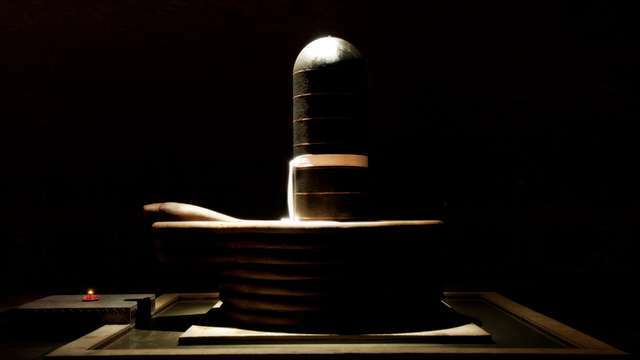 Not everyone will start doing yoga the moment they see his face, but the word “Adiyogi” will slowly work on them. The entire world should know something is being done to create more pleasant human beings. This is the most fundamental business for any generation – to leave the world a little better than the way we found it. In terms of environment, we will not be able to reverse the destruction that has happened in our lifetime. But at least we can leave people in a better state. If they are peaceful and joyful, I am sure they will fix the environment. Let’s make this happen.